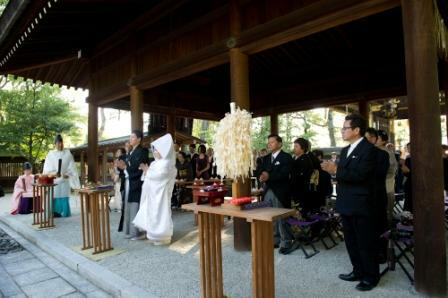 Mr and Mrs K held their wedding reception at Kodaiji Doi after the ceremony at Toyokuni Shrine. 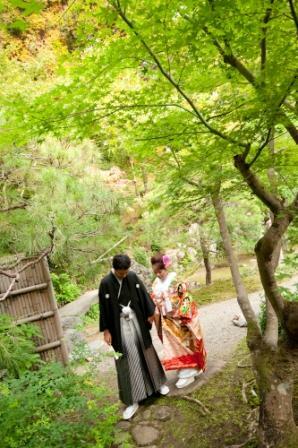 During their ceremony at Toyokuni Shrine bride wore Shiromuku, and before the reception, she exchanged her outfits into colorful Irouchikake. Actually, this Irouchikake was an outfit which her mother wore during her wedding ceremony. The colorful and brilliant outfit would tell us from its beauty that it has been taken cared well even if many decades have past. The mother’s feeling could be tell from that too. Also during the reception, bride has exchanged her outfits to very cute wedding dress which suits on her. And this dress was made by herself!! Many guests have cheered for the wonderful work she had done! Other than the dress, there were many handmade items like name plate, and the seating list, also welcome board made by her sister, and it made the reception into a very warm atmosphere. At the end of the reception, there was a surprise from groom!! Everybody could feel how groom has being thinking bride so important, and the letter made everyone in the reception warm. Mr and Mrs K, who are always smiling, I am sure they would make a wonderful family. 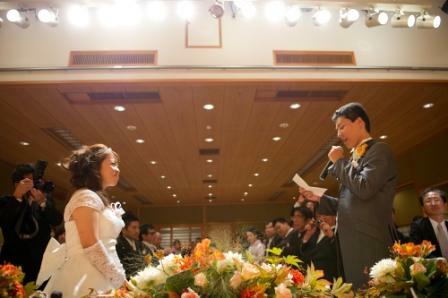 May your family live happily forever, all of the staff are hoping truly for your happiness.